A few months ago I covered an editorial piece from the New York Times that looked at all the action, by which I mean inaction, the federal government had taken on gun violence in the wake of some horrific shootings. Well on Saturday the Washington Post published an article looking at how there has been action on the state level. It used a series of small multiple maps of the United States with states represented as tiles or boxes. 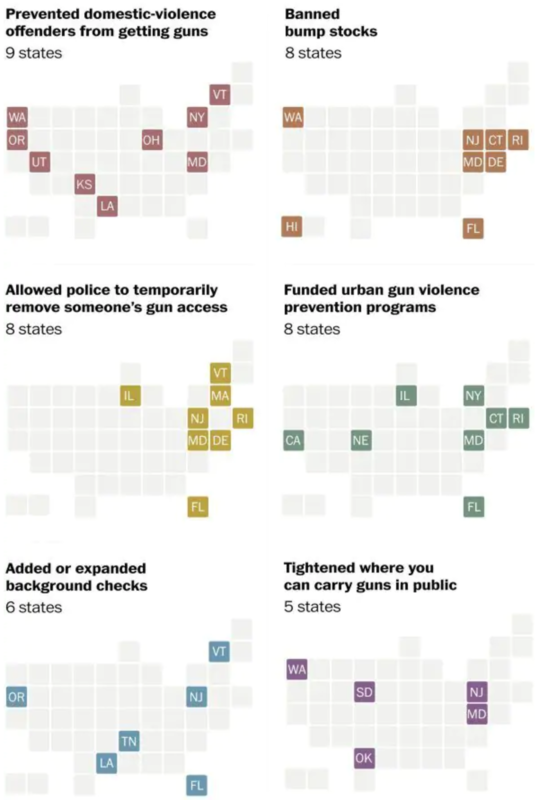 States are coloured by whether they took action in one of six different categories. It is a pretty simple and straightforward design that works well. The only thing I am unsure about is whether the colours are necessary. A single colour could be used effectively given that each map has a clear title directly above it. Now, if the dataset were to be used in another chart or graphic alongside the maps where the types of action were combined, then colours could be justified. For example, if there was a way to see what actions a state had taken, i.e. pivot the data display, the different colours could show what from the set the state had done. And in Pennsylvania’s case, sadly, that is nothing. Credit for the piece goes to Amber Phillips. Back in March I posted about a great graphic from the New York Times editorial board they made in the wake of the Parkland, Florida school shooting. Saturday morning, the day after Friday’s Santa Fe, Texas school shooting, I was reading the paper and found the updated graphic. Yeah, almost nothing has changed. Congress passed and the president signed an omnibus spending bill that included language to improve reporting on background checks. Now from a design standpoint, what’s nice about this graphic is its restrained use of colour. The whole piece works in black and white. Of course it helps that there is nothing to show that needs to be highlighted in the data. For many years I would often tell people that sometimes a visualisation can be “boring”, because the data itself is boring—a lack of growth in a market, no real mergers, or even steady and consistent but unspectacular growth. Those can all be stories, even if they likely result in very monotone choropleths or straight line charts or perfect steps of bar charts. And then there are times when the lack of growth or change, when visualised, can be very powerful. I wanted to share this piece from the New York Times with everyone because it does just that. You really need to click through and see the scale and scope, because the designers behind this did a fantastic job of capturing that sense of lack of change in a very large and expansive piece. Credit for the piece goes to the New York Times Editorial Board. Today’s post was going to be something not this. 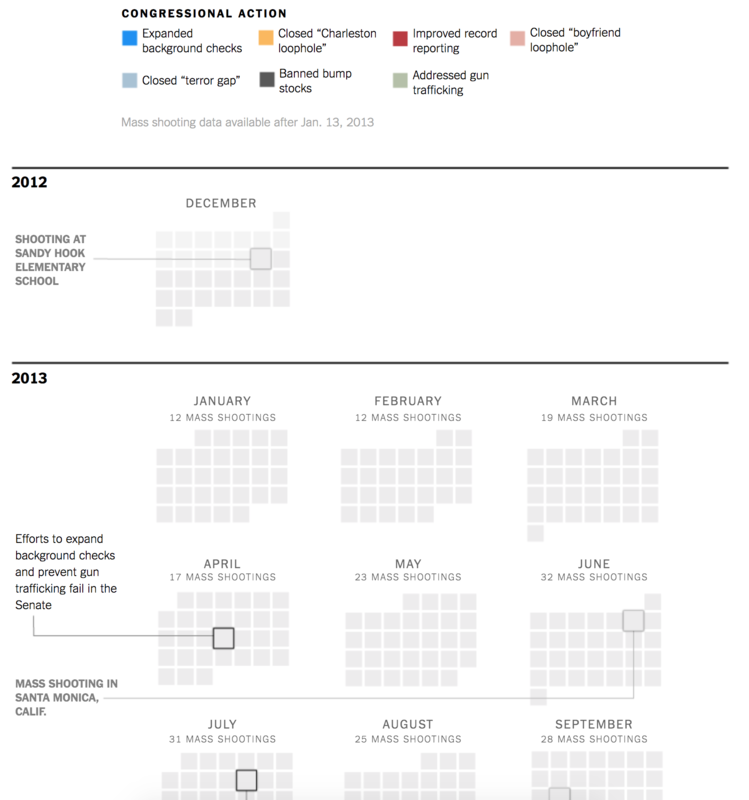 But it is remarkable how many people die in the United States in mass shootings. It is, generally speaking, not a problem experienced in the rest of the developed world. The question is do we want gun violence to really define American exceptionalism? 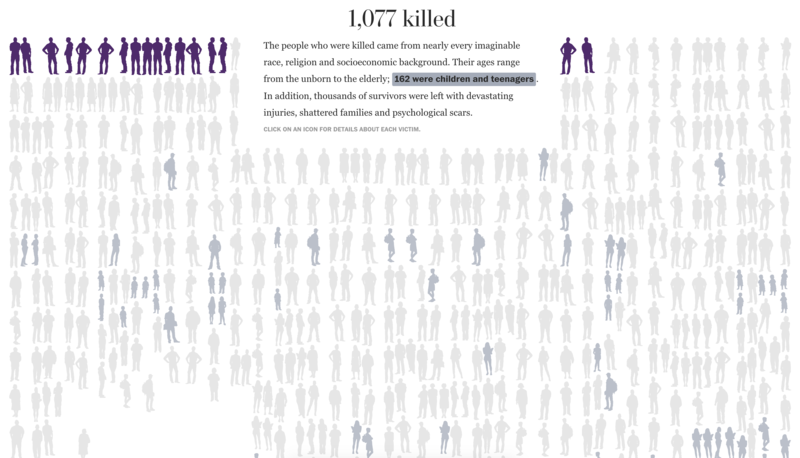 Anyways, the Washington Post has a frightening piece exploring all the deaths, the guns, the killers, and the frequency of the killings. Credit for the piece goes to Bonnie Berkowitz, Denise Lu, and Chris Alcantara.